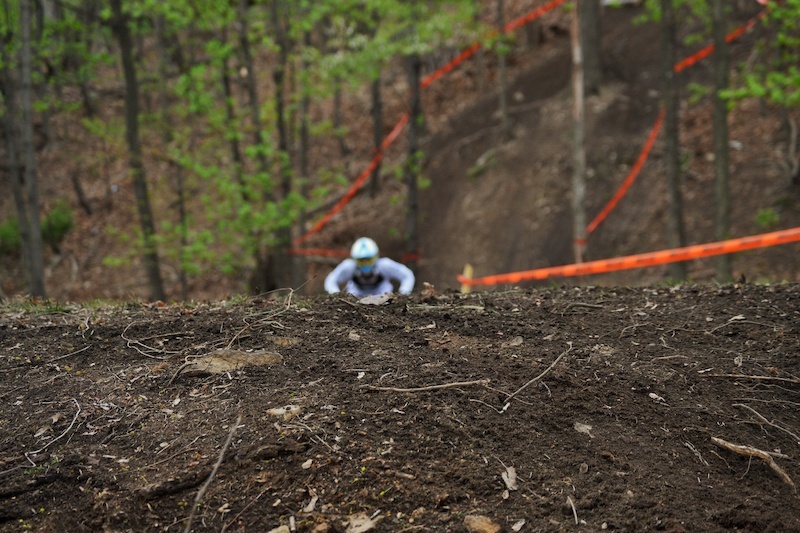 The 2014 downhill season kicked off for the east coast last Sunday with the 2014 POC Eastern States Cup Race #1: Duryea Downhill in Reading, Pennsylvania. 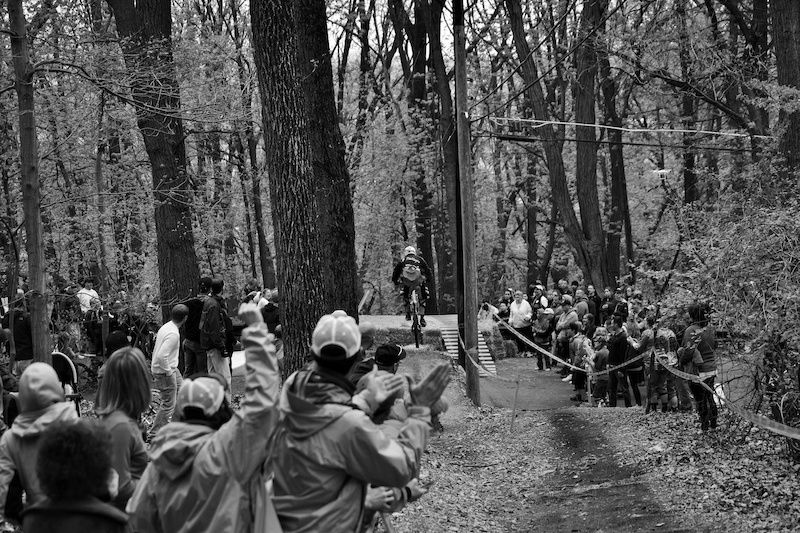 The course famous for it's road gap over Duryea Drive was heavily revamped and enhanced for this year's edition, utilizing numerous jumps, gaps and step-downs to make up for what the course lacks in steepness. Racers start at the top of Skyline Drive, up the road from the iconic Reading Pagoda and roughly 700 feet above downtown. From there they would encounter an extremely technical rock garden along a ridgeline before hitting the first of almost 20 jumps/drops; this one being a 10 foot step-down. 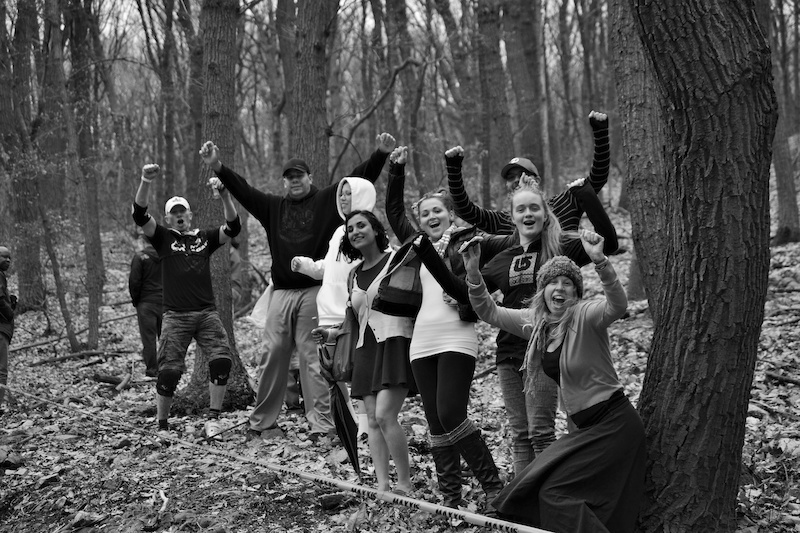 The next mile would feature everything from flowy berms, to more chundery rock, several more step-downs and gaps and a long pedal section before reaching the "big four" features on course. 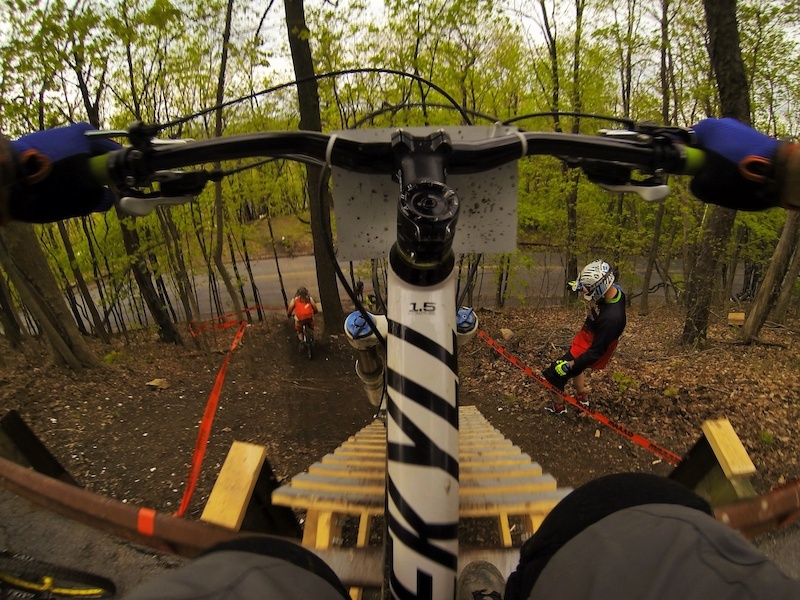 The first was a 30 foot gap that came after a series of moderately sized step downs. 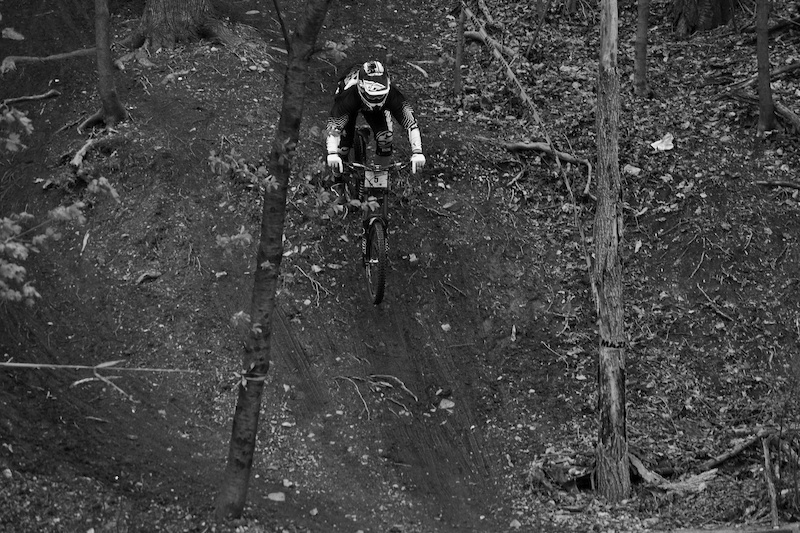 Riders then had about 200 meters to ready themselves for the "Bunker Gap", a 20 foot gap off of said bunker that boosted riders as far up as it did out. Five seconds after landing riders had to decide whether or not to go for the infamous "Road Gap". 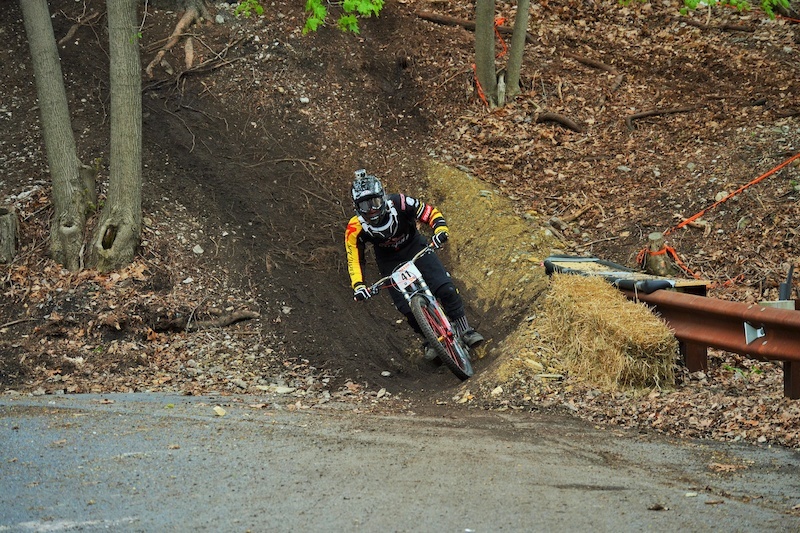 Offering a go-around that was essentially a 10 foot long wooden tabletop; this crowd favorite sent riders 37 feet across Duryea Drive and into a berm where they would then have a go at the speed trap before the final of the big four, the "Gully Gap". 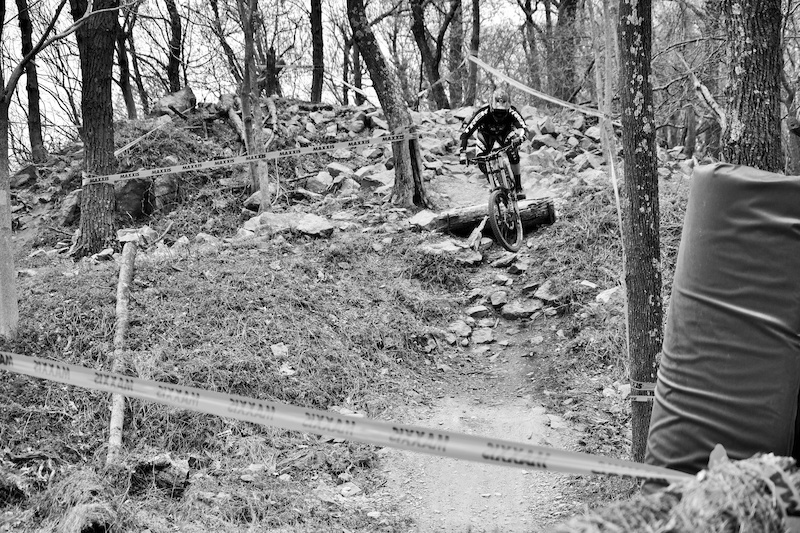 This 15 foot gap required both pedal and braking power, as there would be no gravity feeding into it and upon landing, riders had to slam the brakes and make a sharp right down to a G-Out and across the road to the final section of the course. From there it was all down hill (had to be done), as the steepest sections of the course would bring riders to the finish line. The final two chutes started with an A-frame that dropped riders precipitously onto a tree-laden patch of trail with an awkward exit across the road and down the steepest section of the course and across the finish line. The pros would be the final riders of the day and provided a fittingly dramatic finish to fantastic day of racing. One by one, the pro men came down and played musical chairs with the hot seat until the brothers Mulally came flying across the finish, both well ahead of everyone else. Trek World Racing star Neko Mulally was the first of the two down the course and crossed the finish with an absolutely absurd time of 2:51:84. Younger brother Logan came shortly afterwards and stopped the clock at 2:55:04. 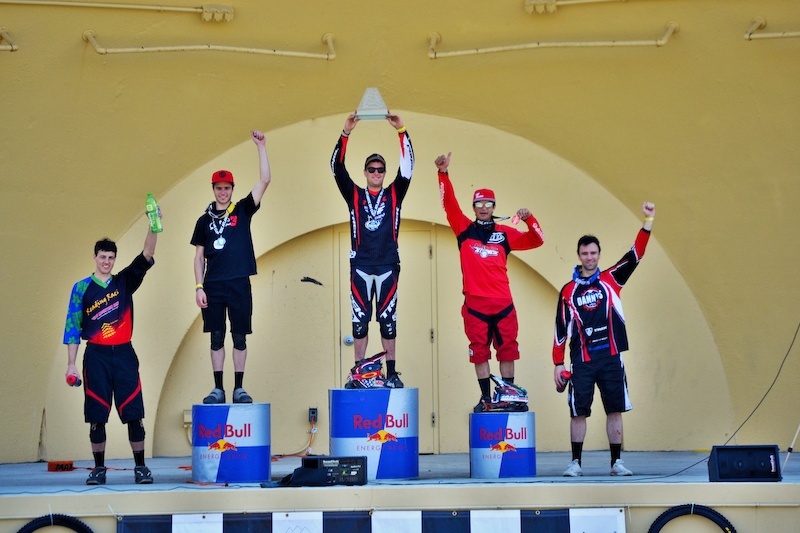 Five riders would follow them across the line but due to some course infractions, both Brendan Looby and Mauricio Estrada were granted additional runs. "Unfortunately my race run didn’t go as planned." 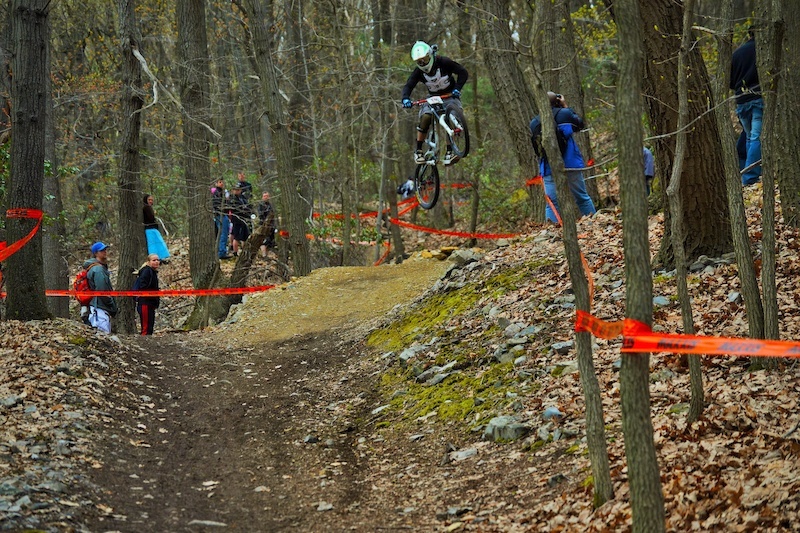 says Mountain Creek Bike Park rider Jon Hanson. 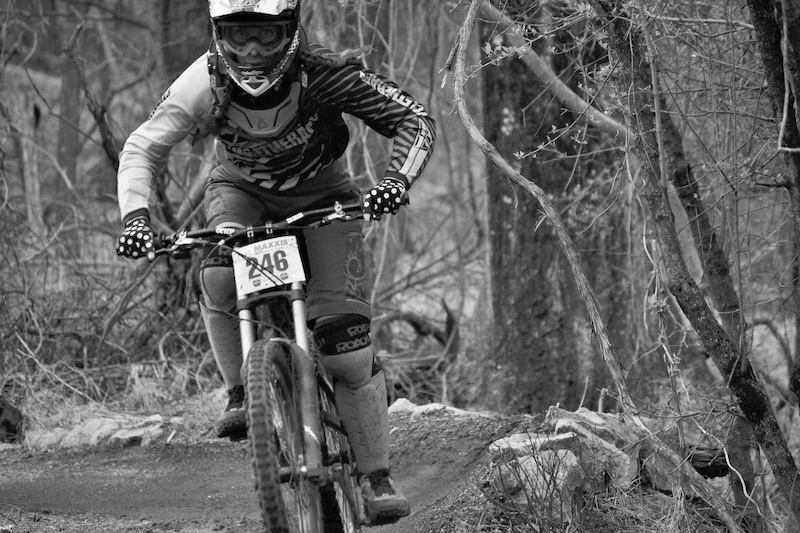 "At the road gap I clipped the last plank above the transition and it sent me over the bars. As I was trying to get back on course I got in the way of Mauricio Estrada. I felt really badly about that and when I got to the bottom I went to the officials and let them know so he could be granted a re-run." Presumably Brendan Looby was halted on course for the same reason and as the two riders made their ways to the top of the course, victory and podiums were left hanging in the balance. Looby would come down first and stop the clock at 3:12:59, bumping Jason Scheiding out of 5th place. Estrada was last on course and would cross the line with a time of 2:56:70, putting him well ahead of local pro Cameron Nyguist and into 3rd place. The pro field for the women went 3 riders deep and Mary Elges dominated, winning by almost 20 seconds over 2nd place Heather Cowell. Stephanie Levesque Sowles would cross the line in 3rd with a 4:18:20. Jonathan Gabor and Amy Temarantz would be the fastest amateurs on the day, crossing the line at 3:08:56 and 4:18:51 respectively. 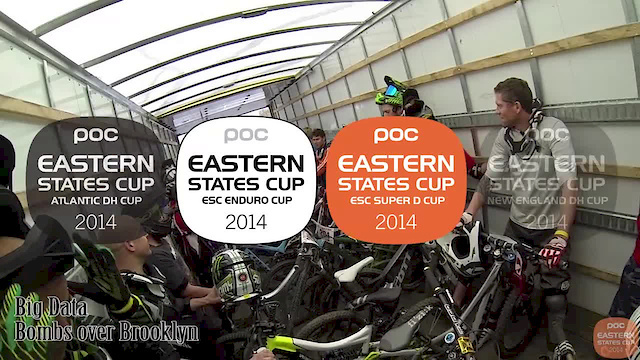 With POC Eastern States Cup and Maxxis Gravity East teaming up for the first race of the year, riders were able to take one race and receive points for two series. Overcast conditions early on couldn't dampen the spirits of the athletes or the crowds, as thousands showed up to cheer on the riders; many hiking up the course from the finish line located in a Berks County park a block outside of downtown. 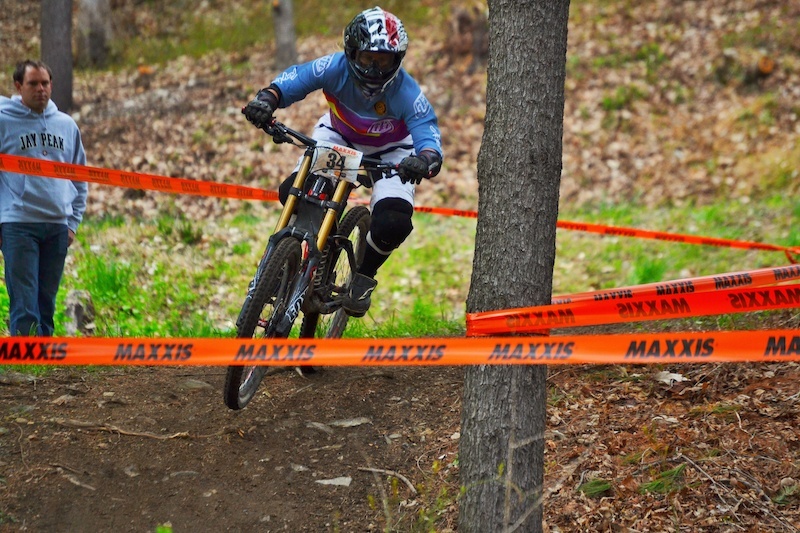 The 2014 Duryea Downhill proved a great start to what is shaping up to be a game-changing 2014 downhill season for POC Eastern States Cup and the east coast. 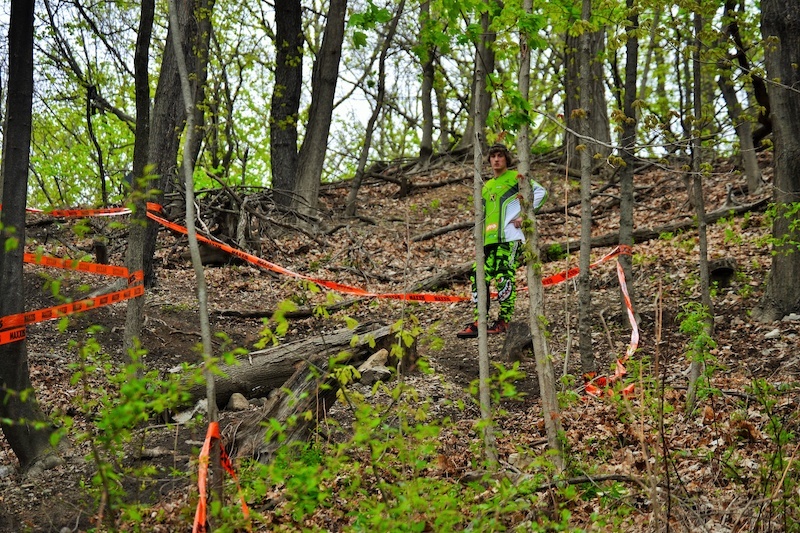 For more information and race schedules, please visit: www.easternstatescup.com/series-information/. Jon Hanson, what a gentleman! Estrada was held up twice. The rider before him crashed off the berm after the road gap right into the blue pad. He had to slow down when he caught up to him before the gully gap jump. I'm so pissed, I left early to go shooting, I would have killed to watch neko race live. anyone know where I can find more photos of the course? sounds awesome!